The water at the Blue Water Bridge has most wonderful blue tints not seen in other freshwater. Photographs courtesy of Cathy Gardiner, Blue Water Bridge. We recently returned from a lovely visit to Great Lakes country, the North Coast. Our niece, Evelyn, is engaged. Her mother, Kelly, invited Dorothy and Lily, my wife and daughter, to the shower in a community south of Detroit. To shorten the trip, we drove across Ontario, rather than around the American side of Lake Erie. Customs was quick both ways as we were going in the opposite direction of other tourists and truckers. American and Canadian traffic was heavy but moving fast. Lake Ontario and Niagara Falls were bright and out-sized. Many of flowering trees - - pear, redbud and dogwood - - were at their peak. 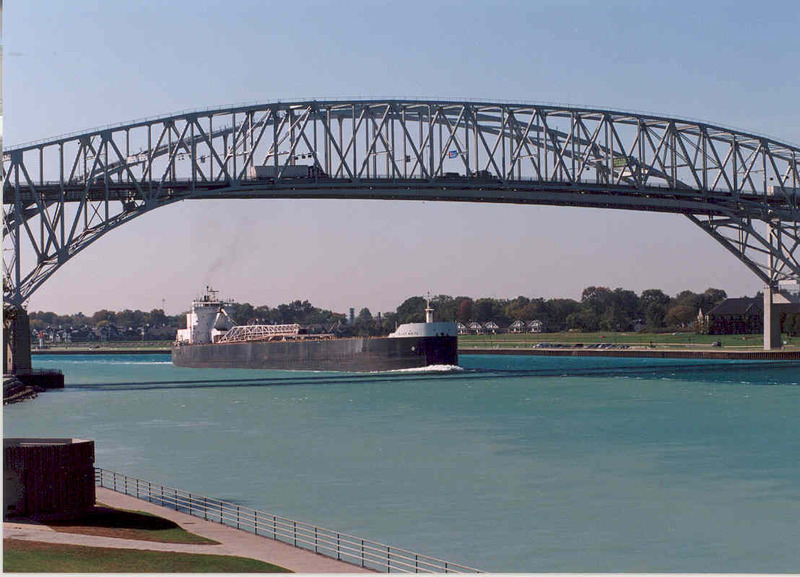 At the western end of our trip, we left and entered the United States on the Blue Water Bridge, connecting Sarnia, Ontario and Port Huron, Michigan. When planning the trip, I assumed naming a bridge “”Blue Water” was a marketing trick. But when you cross the Bridge on a sunny day, the water has these incredible, shifting hues of blue and turquoise. Thanks to Cathy Gardiner, from Blue Water Bridge Canada, this post leads off with two pictures of this incomparable water! If you stop for duty free on the way into Michigan, just past the toll booths on the Canadian side, the shop has won a platinum (first place) award in seven of the last nine years as the best duty free shop in Canada. Detroit and Michigan are often used as symbols of urban and industrial decline. However, residents of the region are not giving up the ghost. The New York Times wrote about the lively life in Detroit this past weekend - - but you read about the good things happening here three weeks earlier. There are still many, functioning businesses. Communities are mostly lively, although a close look reveals some foreclosed homes. And the region has great public institutions. For example, while the women were at the shower, the guys hiked in a Metropark, at the point where the Detroit River starts widening into Lake Erie. The park had well-maintained hiking trails, interesting meadows and shoreline views and informative staff. One of the best parts of the trip was reconnecting with family. Much time was spent reminiscing about the past and talking about what was in store in the future. I managed to lose three or four pool games to all my in-laws, but that was fun anyway. Kelly and Russ, her husband, fueled all the conversations with wonderful food and hospitality. We got in on the late side, but when we arrived, they had extra barbecue, a welcome change from road food. When traveling from Buffalo to Canada, crossing the bridge near Lewiston and driving Interstate 190 is often the quickest route. On the way home, we took the Robert Moses Parkway south, instead of I-190. Between the bridge and City of Niagara Falls, New York state has closed two of the Parkway’s four lanes to vehicular traffic and made the lanes a bike/pedestrian path. This is a great idea, it forces drivers to slow down and see nature and history along the way. We will be on the road for the wedding. And when we are, it will be great to see family again - - and to see how a new season changes the landscape.